The group was created in July 2001. Broadly speaking, we are interested in the evolutionary biology of microbes. More concretely, this interest is focused in the study, within the framework of Populations Genetics, of the mechanisms that generate and maintain the genetic variability of RNA viruses. 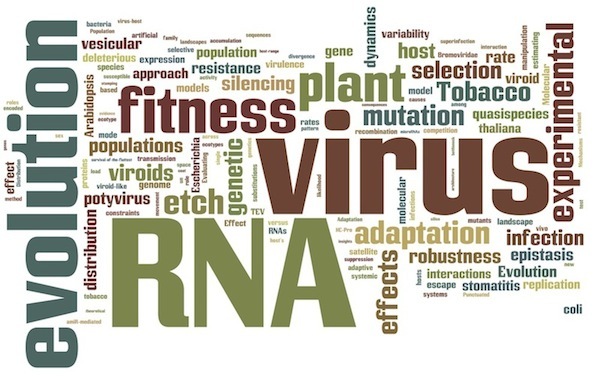 The model systems that we use now for our experiments are the RNA viruses Tobacco etch potyvirus (TEV) and Turnip mosaic potyvirus (TuMV), the para-retrovirus Cauliflower mosaic caulimovirus (CaMV), and the viroids. We have also been exploring the endless potential of digital organisms as model systems for evolutionary studies. And finally, to avoid missing the wave of Systems Biology we are now developing in silico and mathematical hierarchical models of the entire viral infectious cycle.